I also welcome back Ashley Mead in a new segment I’ve dubbed: Calling You – at a Moment’s Notice! Ashley’s got an interesting new hobby that really gives you the perspective from 15,000 feet. 21:51 Where can we find them? 22:51 Mr. Media rolls us out. Readers of this blog will know that one of my favorite podcasts is “For Immediate Release: The Hobson and Holtz Report.” If you’re reading this blog and not listening to FIR, stop reading right now, go to ForImmediateRelease.biz and sign up for the blog and podcast feed. Or, as an introduction you can check out this Saturday’s live episode on BlogTalkRadio. This Saturday, February 9, at 10am PT/1pm ET/ 6pm GMT, hosts Neville Hobson and Shel Holtz will host a special live call-in edition of “For Immediate Release: The Hobson and Holtz Report” on BlogTalkRadio. The call-in episode will focus on the blurring of the lines between internal and external communications. If you work in external PR, how do employees of your (or your client’s) company affect your communication efforts? If you work in internal communications, how does your role change in order to prepare employees for their growing role as points of contact and brand experiences in the social media sites where they participate? 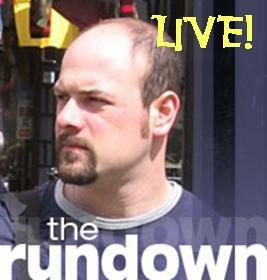 It works just like my show, The Rundown. Visit the FIR BlogTalkRadio profile page to listen or call 347.324.3723 to join in the conversation, (you may also listen via phone, pressing ‘1’ to be put in the talking queue). If you miss the live show, the audio will still come through the podcast feed, so no worries. Should be great show and I hope to hear you there. Update: I made New PR ! Thanks, Constantin. Well, I had this crazy idea. And like a fool I acted on it. I couldn’t help it. It was driving me crazy. I had to let it out. Since I’m in Ohio and jealous of all the geek dinners and social media events, I made one up. Yes, I fabricated a geek dinner with some influential PR podcasters and me at a bar. And well, sure, I took a few creative liberties. But only at the expense of other people, see. Deep down, I’m sure they truly appreciate the attention. Special thanks to the guys at Inside PR (Terry and David) and For Immediate Release (Shel, Neville) for being good sports about this (I hope). Special guest appearance by Paullscilla, Queen of the Desert. It comes in at 11:10, and my testers enjoyed it. I hope you do to. Link straight to the mp3 here. What Color is Your Expert Social Media Guru? Parachute, my eye. I want to know what color your favorite social media, new marketing hero is. By now you’ve heard (unless you live under a blogosphere rock, i.e. are offline) that all our favorite podcasters have joined together to form an honest to goodness virtual company focusing on all aspects of communication. Instead of offering social media as an afterthought, crayon will be incorporating every strategic tool at its disposal to fit the needs of its clients. The biggest boxes of crayons come chock-full of dozens of colors, Joe notes, but most communicators (marketers, advertisers, PR folk, corporate communications pros) seem always to start with red, green, and blue. crayon is ready to pull any color out of the box and we definitley [sic] will not start with red, green, and blue. Best of luck, gentlemen, to you and your NY behind-the-scene troop, as well as your incoming freshmen. I wish I could join you, but my accolades aren’t as bright and I’m not sure what I can do from NE Ohio. Keep on keepin’ on.